This module provides support for Java Programming Language 'snippet' evaluating tools, such as Read-Eval-Print Loops (REPLs), including the jshell tool. Separate packages support building tools, configuring the execution of tools, and programmatically launching the existing Java shell tool. The jdk.jshell is the package for creating 'snippet' evaluating tools. Generally, this is only package that would be needed for creating tools. The jdk.jshell.spi package specifies a Service Provider Interface (SPI) for defining execution engine implementations for tools based on the jdk.jshell API. The jdk.jshell.execution package provides standard implementations of jdk.jshell.spi interfaces and supporting code. It also serves as a library of functionality for defining new execution engine implementations. The jdk.jshell.tool package supports programmatically launching the jshell tool. The jdk.jshell.execution package contains implementations of the interfaces in jdk.jshell.spi. Otherwise, the four packages are independent, operate at different levels, and do not share functionality or definitions. Provides interfaces for creating tools, such as a Read-Eval-Print Loop (REPL), which interactively evaluate "snippets" of Java programming language code. Provides implementation support for building JShell execution engines. Defines the Service Provider Interface for pluggable JShell execution engines. 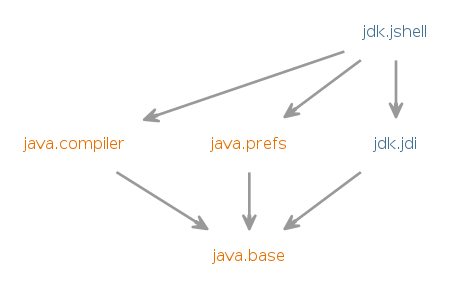 Provides a mechanism to launch an instance of a Java™ shell tool.